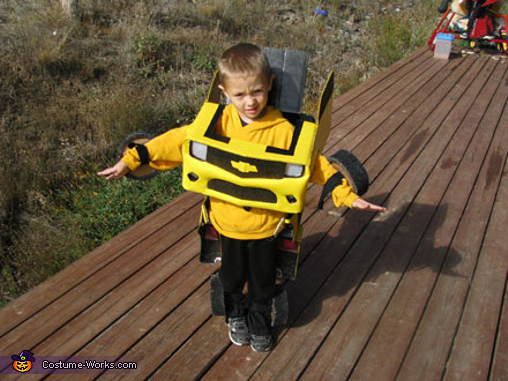 This homemade costume for boys entered our 2010 Halloween Costume Contest. Any directions on how to make this?? PLEASE send directions on how to make this?!?! Hi, it is great, could you send me the instruction? HELP! i am loving your creation!!! please send instructions on how to do it or a closer picture for viewing. thank you very much. Love this! Do you mind sharing detailed instructions? Could I get instructions on how you made this please? Hi, Could You send me also the instructions on how you made this please? I'm sure you are tired of this, but can you send instructions on how you made this? Hi, I really love your costumes. Could I get instructions on how to make it, please? This costume is amazing! My son appears to be the same size.... are you sick on sending instructions? I would love them if you aren't too tired of it yet! Thank you for considering! I'm going to jump on the bandwagon here. I have a very persistent toddler who wants to be bumblebee. Can I also have a copy of the instructions?